The Great Lakes are the largest group of freshwater lakes on earth. Lakes Erie, Huron, Michigan, Ontario and Superior comprise the five lakes that are found in the northeastern part of the U.S. and on the U.S.-Canada border. The total surface area of the Great Lakes is 94,250 square miles (16,900 kilometers) and the Lakes contain about 21% of the world's freshwater. In addition to the stunning scenery and their role as an important waterway between states and territories, the Lakes are a popular tourist destination for their many outdoor activities, such as boating, fishing, camping and biking. 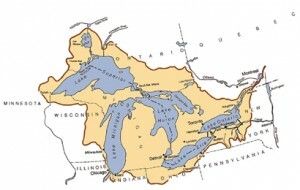 About 70 million people visit the Great Lakes every year. Visit Mackinac Island. This car-free island in Lake Huron is a popular vacation destination for many midwesterners and other Americans.